Create a suite of tools to augment the ESPN Fantasy Football game that provides players with additional methods of engaging throughout the season. - Drive sign-ups and retention for the following season. - Give fantasy football players a reason to choose ESPN over other services by differentiating the product. - Intelligent Interface: The toolkit responded to the user type, whether a Commissioner, Team Manager or New User. This year we opened up many features to all users. 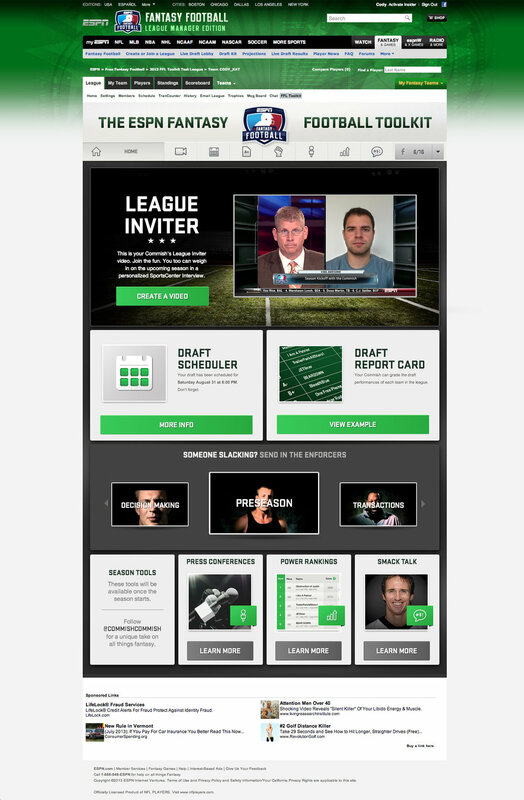 - Prioritized Functionality: The Fantasy Football Season timeline informed the layout of the site. During Pre-Season, the focus is on the Draft. As we move into the season, the priority shifts toward Season tools. This kept the content relevant and fresh. I worked with production on the initial pitch for work (both years) and helped in putting together the project proposal and production timeline. I also lead the creative team from initial white-board sketches through development and QA.